SALT LAKE CITY (August 29, 2018) – Winter is less than 100 days away and Utah’s ski resorts are readying for another successful season full of The Greatest Snow on Earth®. With a variety of new offerings, including new lifts, hotels, restaurants and on-mountain amenities, visitors will find great skiing and riding coupled with unique experiences across the state. Park City Mountain photos available here. Snowbird bridge construction photos available here. Construction of a new restaurant and additional conference space has begun on the west side of The Cliff Lodge. This family-friendly restaurant provides unobstructed mountain views, tiered seating and an outdoor patio with fire pits. The project also includes additional interior and exterior event space for private functions. The Cliff Lodge West Wing Addition has an estimated completion of Winter 2018-19. Sundance Mountain Resort is celebrating its 50th anniversary this winter. Acquired by Robert Redford in 1968 and renamed to Sundance Mountain Resort in 1969, the year-round resort was the starting point for the popular Sundance Film Festival and non-profit Sundance Institute. In addition to 450 skiable acres of The Greatest Snow on Earth®, Sundance Mountain Resort unites art, nature and commerce to inspire and develop people, voices and ideas. Redford wanted “to develop a little and preserve a great deal,” and those words have rung true over the resort’s rich 50 year history. Eagle Point Resort announced the groundbreaking for turnkey Twin Homes in the new Aspen Crest at Eagle Point collection of ski-in/ski-out homesites and future condominium community currently in development in the heart of the resort. Some of the Twin Homes are expected to be ready by winter and potentially available for guest lodging. Additionally, renovation continues on many of the existing ski-in/ski-out condominiums throughout the resort. The town of Huntsville in the Ogden Valley is opening a one-of-a-kind hotel near Huntsville Square. The Compass Rose Lodge is a boutique, 15-room hotel and will be one of two hotels in the country built around a high tech telescope. Lodge guests and the community will be able to view neighboring celestial bodies with great detail such as the rings of Saturn or Jupiter’s Galilean Moons. Views of spectacular deep sky objects including galaxies, nebulae and globular clusters await those wishing to peer farther into the heavens. The hotel plans to open December 1, 2018. Built in 1938, the historical Snowpine Lodge at Alta Ski Area was the first ski lodge in Little Cottonwood Canyon. The expansion includes new rooms with a luxury mountain feel. With several different room options, the Snowpine is a great option for families. The property will also include a full-service restaurant, après ski bar, outdoor pool and hot tub, indoor grotto, a game room and a ballroom. The Snowpine Lodge is now accepting reservations for arrivals after January 16, 2019. Stein Eriksen Lodge at Deer Valley Resort in Park City is completing a $14 million expansion this fall that includes a new pool, outdoor deck and plaza, entertainment center, movie theater and slopeside coffee shop. The 3,500-square-foot Champions Club entertainment center includes arcade games and casual dining. The theater shows sporting events throughout the week and family movies on weekend evenings. The new outdoor family pool is also being added to the Lodge, in addition to an outdoor plaza with two fire pits and heated walkways. Immediately above the plaza, the upper deck has been expanded to allow for more outdoor dining. Stein Eriksen Sport ski shop and guest ski lockers have also been expanded and enhanced. Compass Sports at Montage Deer Valley is launching a 3D boot and ski fitting system using Wintersteiger’s Bootdoc Scanner Vandra and SizeFit stations. The system will take a 3D scan to analyze all measurement data from instep height to ankle circumference and foot length and width, which will determine the perfect custom boot. This new technology will make the guest ski fitting experience more experiential and efficient as it uses the SizeFit station measurements for adjusting bindings instead of ski boots. Skiers and snowboarders flying in and out of Salt Lake City International Airport (SLC) this winter will notice a large construction project underway – SLC is building a new airport! The new airport facilities are being designed with state-of-the-art functionality and for ease of use. After the first phase of The New SLC opens in 2020, demolition of the existing facilities will begin so the second phase of construction can get underway. The full project is expected to be finished in 2023/24. The New SLC will create a memorable travel experience for passengers, whether they’re connecting to another city or making SLC their final destination. For updates about the project, go to www.slcairport.com/thenewslc. Utah Transit Authority will continue working with local resorts to provide the ski bus servicefeeding Alta Ski Area, Brighton Resort, Snowbird, Solitude Mountain Resort, Powder Mountain and Snowbasin Resort. The most up to date route information will be available at rideuta.com. The world’s best skiers and snowboarders will make their way to Utah this winter for the 2019 FIS World Championships. Deer Valley Resort, Park City Mountain and Solitude Mountain Resort will host events February 1-10, 2019. The Championships will include more than 25 medal events over 10 days, including the newest Olympic sports of men’s and women’s big air skiing, team aerials and team snowboardcross. Over 700 athletes are expected to compete, making this the largest international ski and snowboard event Utah has hosted since the 2002 Olympic Winter Games. With a variety of pass options available, skiers and riders have access to multiple Utah resorts as well as resorts around the country. Ski Utah Gold Pass ($5,200): The Gold Pass is Utah’s only fully transferable lift pass. It is valid for 50 days of skiing/riding at each of Utah’s resorts except Park City Mountain where it is valid for 100 days. It is also valid for summer lift access to resorts open during the summer months. Limited quantity available. Ski Utah Silver Pass ($3,250): The Silver Pass is valid for 30 days of skiing/riding at each Utah resort except Park City Mountain, where the pass is valid for 60 days of skiing. It is also valid for summer lift access to resorts open during the summer months. Limited quantity available. Ski Utah Passport ($45): This pass offers fifth graders three days of skiing and sixth graders one day of skiing at each of Utah’s resorts. New this season – Passport sign up and on-mountain redemption are going digital! Visit skiutah.com/passes/passport to get notified once applications are open. Ski Utah Yeti Pass ($649): The Yeti Pass is good for one lift ticket at every Utah resort and is a great option for parents with children who participate in the Ski Utah Passport program. Ski City Super Pass (price varies): The Ski City Super Pass allows unrestricted access to Alta Ski Area, Snowbird, Brighton Resort and/or Solitude Mountain Resort. The pass can be purchased for a range of three to 10 days of skiing. The UTA ski bus is free to and from the resort with the purchase of this pass. Price varies depending on the number of days purchased. Epic Pass ($899): The Epic Pass offers unrestricted access to 65 ski resorts throughout the world, including Utah’s Park City Mountain. Number of days vary by resort. For lower rates with a few restrictions, there are the Epic Local Pass, Epic 7-Day Pass and Epic 4-Day Pass, Park City Youth Pass and Park City 4-Pack. An Epic Military Pass is also available. Ikon Pass ($999): New for the 2018-19 season, the Ikon Pass offers access to more than 30 resorts around the world with no blackout dates, including Utah’s Deer Valley Resort, Alta or Snowbird, Brighton Resort and Solitude Mountain Resort. An Ikon Base Pass is also available for a lower rate with few restrictions. 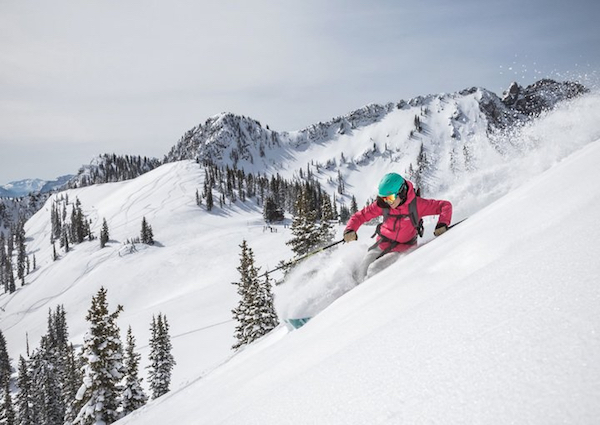 Mountain Collective ($449): The Mountain Collective offers two days of skiing or riding at 17 iconic destinations, including Alta Ski Area, Snowbird and Snowbasin Resort in Utah. There are no blackout dates and passholders get 50 percent off all additional days at Collective destinations.